Mark your calendars, virgins! Freeform just announced that a Hocus Pocus anniversary special is headed to the network, just in time for Halloween. 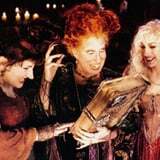 The film's official 25th anniversary passed back in July, but Freeform picked a slightly more appropriate time to celebrate the occasion, given all the Halloween inspiration Hocus Pocus has contributed to pop culture since it was first released in 1993. The Hocus Pocus 25th Anniversary Halloween Bash will air on Oct. 20 as part of the network's 31 Nights of Halloween lineup, and it's set to feature interviews with a few of the movie's original castmembers: Sarah Jessica Parker, Thora Birch, Kathy Najimy, and Amanda Shepherd. Sharon and Kelly Osbourne will also be in attendance at the bash to host a costume contest, and Dove Cameron is one of three artists set to perform. It might be a while before we get that Hocus Pocus sequel, but if you're feeling antsy about it, you can at least celebrate Halloween this year by tuning in to the classic film that started it all.